2018 January CEO Report: Most CEO Changes Since February 2010 | Challenger, Gray & Christmas, Inc.
January’s total was a 39 percent increase from December, when 95 CEO exits were reported. 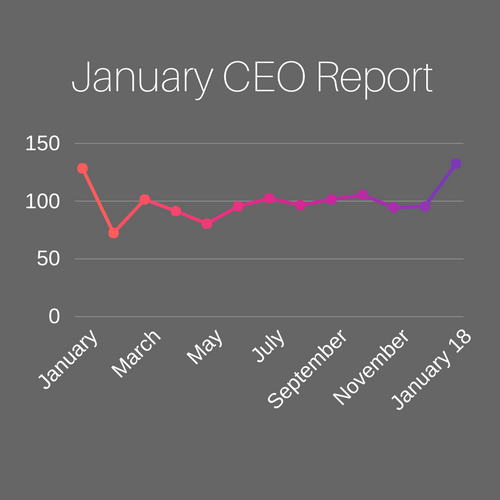 Last month’s total was 3 percent higher than the same month last year, when 128 CEO exits were announced. “January is typically a busy month for CEO turnover, as companies have made leadership decisions in the fiscal year’s end for the upcoming year,” said John Challenger, Chief Executive Officer of Challenger, Gray & Christmas, Inc.
“However, the average number of exits in January is 106. Last month’s high total may signal that companies are coming to grips with how recent legislation may impact operations, and have chosen new leadership to guide their companies through any changes,” added Challenger. “That said, our data suggests many former CEOs are staying with the company in some capacity, so boards likely want institutional knowledge to remain intact. The high tenure also suggests boards are replacing long-term CEOs for someone with new ideas and ways of doing things,” said Challenger. Twenty-seven percent of CEOs will remain with their companies in some capacity, most often as board members. Six of those stepped down into other C-Level roles. Meanwhile, the average tenure for exiting CEOs was over 17 years, the highest on record. Thirty-eight CEOs retired, while 22 resigned. Twelve CEOs found new positions in other companies. The Government/Non-Profit sector led all departures in January with 20, 33 percent more than the sector announced the same month last year, when 15 CEOs left their posts. Computer companies announced 19 exits, while Financial companies reported 17. California companies saw the highest number of CEO changes with 20, while companies in Texas saw 12 departures last month.